This adventure was going to be a long one, into parts of the country I’d never seen before. The night before my excitement about the trip woke me up at 1:00 AM. I was able to force myself back to sleep for a couple more hours. Just before 5:00 AM I started for Bernalillo and found Steve waiting for me. Then we started north in the dark towards Santa Fe. As we made our way around Santa Fe on the bypass the sun was just starting to rise. Right as we got to Espanola, the road took us right into the clouds, they were so thick it was hard to see the traffic lights. North of Espanola we gassed up and met up with Gary (he rode over from Los Alamos). All along US 285 the low clouds provided us with a fantastic view. When we got to the San Antonio mountain it was ringed with clouds all around it’s base. Because we were pushing for distance I didn’t stop for pictures, something I’m very sorry about. In Alamosa we stopped at the Campus Cafe for a quick breakfast. If you have read some of my other reports, you know it’s one of my favorite places to eat is this area. Gary ordered the French toast, giving me a chance to provide a picture that I failed to get last time I ate here. After breakfast we pushed on to Fairplay for gas and then on to Denver. When we got to Denver it started to warm up. As we snaked through heavy traffic still in our rain suits, even at speed it was getting very hot. In Loveland we exited Instate 25, after stripping off our rain gear we contacted the other half of our group and found them in a nearby Steak House. We joined up with Mike, Fred, Billy and Lonnie for the rest of the interstate ride into Douglas. 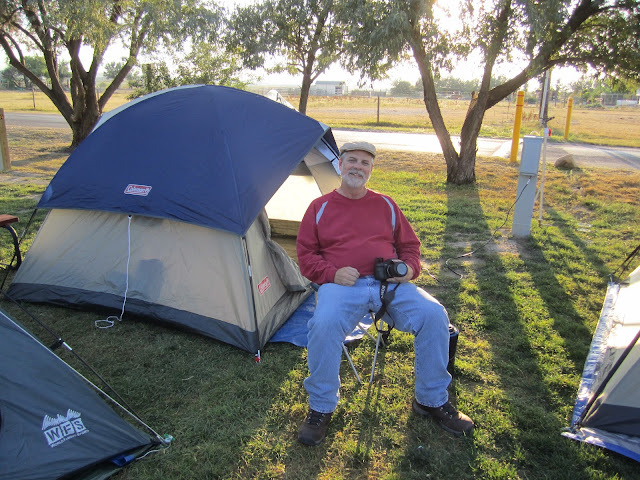 In Douglas the hotel group split off to their rooms and we went to the KOA at the edge of town and setup our camp. After we got our camp setup, we rode into town and grabbed a Subway sandwich, then headed over to the other group’s hotel. We talked with then for a while before riding back to our camp where we shared a drink before calling it a night. We met the hotel group in Douglas and started north on WY 59 to Gillette. Several buses full of workers passed us going south into Douglas, it looks like there must be work in Douglas. In Gillette we ate breakfast at Lula Belle’s Cafe, this is the kind of place you hope to find while on the road. The service was great, the food was outstanding. My breakfast was biscuits with gravy, hot links and eggs. It’s really a good thing this place is so far from my house, because I’d be eating here all the time. After eating a great breakfast we made our way on I 90 to Moorcroft, where we turned onto WY 14, then WY 24 to the Devil’s Tower. We stayed on WY 24 till we crossed into South Dakota where it became SD 34 and followed it to US 85. After passing through Spearfish, we started down SD 14 and Spearfish Canyon. The views and the road make this piece of highway something you don’t want to miss if your in this area. While the other were taking a short break I rode over to Roughlock Falls. There is a very nice picnic area at the top of the falls, the grass looks like a putting green. Before we got to Lead, traffic was stopped for road repair, this was the second time today we waited on the road, both times in South Dakota. After riding through Lead, a town filled with interesting buildings, we came upon Pactola Reservoir as we rounded a turn. I’m very sorry this picture doesn’t do this body of water justice. When we got to Keystone we split with the hotel group and went to setup our camp. After we got our tents ready for the night a flock of turkey moved past our camp. We rode the couple of miles back into town and met the others for dinner at Teddy’s Deli. Teddy’s Deli had their reuben sandwich featured on the Food Network, so I split the reuben with Steve. The reuben was delicious, but it was the their chips that sold me on the place. If you find yourself in Keystone give Teddy’s a try. After dinner we made our way back to camp, we sat and talked for a few minutes then it was time for the showers to clean off the road dust and bed. We had a 7:50 KSU from a gas station in Keystone, before our very short ride to Rushmore. Rushmore is free, but they charge you to park, and you can come back for no charge for a year if you can keep some paper on your handlebars. We left Rushmore around 10:00 and drove to our next stop; to see Crazy Horse. We went south without using the interstate or going into Nebraska. It was a perfect day for riding, it was around 70 and we pushed it all day. We didn’t stop for food or pictures our only stops were for gas. This route was filled with open prairie, fields of wheat, corn and even some sunflowers. I needed a bigger gas tank for this route, but it worked out. There was one spot where we went 130 miles with no gas stations, that’s a little tight for me. As we were heading west to Colorado Springs, a rain storm covered the mountains. The sun was shining through the storm. It was an incredible view and we got to enjoy it for about 30 minutes as we rode. We split with the others just before Canon City and made out way to our KOA. The Canon City KOA is not in Canon City and they don’t have a sign were you need to turn off the highway. We found the turn off on our second try. Just as we got our tent setup the sun dropped below the horizon. While we were more hungry than tired, so we headed to a near by bar/restaurant for our first meal of the day. I forgot my camera and was too tired to care. This day’s route pushed me and I felt it. After dinner we headed back, cleaned up and went to bed. The people at this KOA were nice, but the tent sites were just dirt and there was a really bad smell coming from something. It’s not one I’ll be staying at again. I was up and packed before 7:00, told Steve and Gary goodbye and started for home. Took US 50 west to US 285. Riding with the sun at my back through a canyon with a river running along side the road, how can it get any better? Near Salida I pulled over to take a picture of some deer standing in a field. As I took out my camera and turned around a police car with lights appears. He told me I was speeding and he thought I pulled over because I knew I was busted. Showing him my camera and pointing to the deer in the field, I said to him, “I pulled over for a picture”. Then he said, “give me your licence and registration, then you can take the picture”. After sitting in his cruiser for a few minutes he got out and tells me I’m not getting a ticket. He was very nice and he asked about when I’d been. After telling him about my trip, he told me I could see the sights better if I slowed down. Because I failed to take a picture of San Antonio mountain on the way north, I stopped and took one going home. It seems like almost home is getting farther and farther away, but after taking this picture I feel like I was almost home. This was a long fun ride and I would like to thank Mike, Billy, Lonnie and Fred, for putting up with me and my tiny tank. As always I really enjoy spending time with you guys. As for Gary and Steve I’m glad we camped, there were a couple of days a hotel would have been easier, but no way it would have been as fun. That flock of turkey making their way across our camp is a story I’ll be telling for a long time. It’s just another one of those shared experiences we got from this trip. Wow, great ride and a ton of miles in a few days!